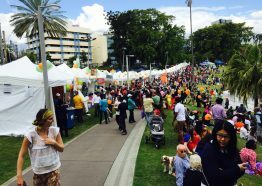 Queensland’s beautiful weather provides the ideal conditions for the perfect garden wedding, either at home or in one of the many beautiful parks or outdoor venues available in and around Brisbane. 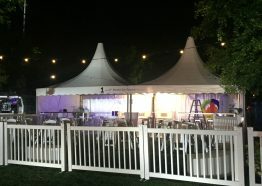 A beautiful white free standing pavilion with silk lining will set the tone, and with a selection from Event Rentals comprehensive range of furniture, table settings, catering equipment, dance floors, function toilets etc the stage will be set for your happy occasion. 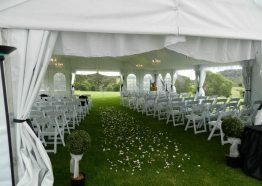 Why not hire a Marquee and have us install in your backyard or the backyard of a friend or family member. One of the often overlooked benefits of a self hosted wedding is the lack of deadlines like closing times and restrictions on staff working hours, which can bring your guests enjoyment to a premature end. Why should the celebrations finish when the last bars of ‘Auld Lang Syne’ are sung?